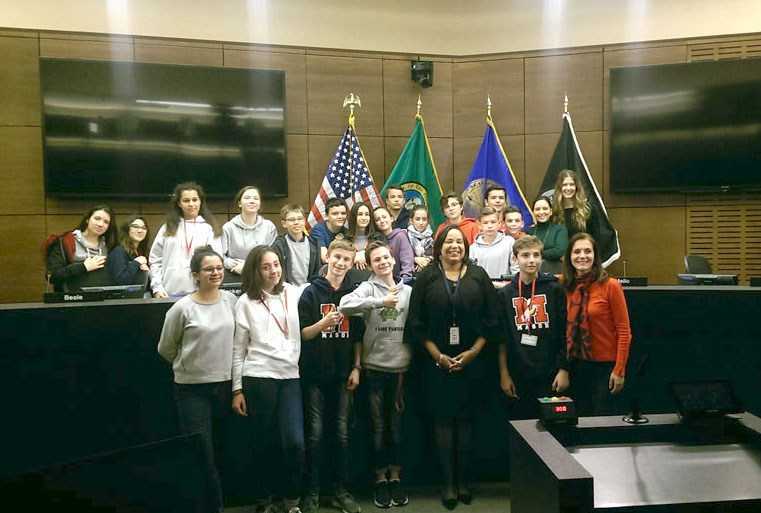 On April 8th, the city of Tacoma, Washington welcomed 19 eighth grade students from the College I’Eganaude in its sister city of Biot, France. This marks the first-ever student exchange between Tacoma and Biot, who have traditionally had a very strong arts exchange program. Recently, the two cities have looked for more ways to expand their relationship. In October 2012, Biot become Tacoma’s 12th sister city; and while most Sister Cities relationships focus on ties stemming from common geography, size, or economy, Tacoma and Biot’s commonality is glass blowing. Both cities are considered the glass art capital of their respective countries, which has led to a strong relationship that eventually morphed into a pen pal program between students of Mason Middle School and College I’Eganaude. Molly Higgins, A French teacher at Mason Middle School, started the pen pal program four years ago and, since then, students exchange letters with their Biot counterparts at least once per school quarter. In 2016, the desire for an exchange heightened when Higgins traveled to Biot for a week. Later that spring, Higgins hosted a teacher from Biot and began the coordinated effort to start a student exchange program between the two cities. The exchange became a reality through fundraising efforts last May. Students in Biot received grants and funding from the French Ministry of National Education, the American Embassy in France, Biot Town Hall, and supportive businesses in and around Biot. Students also created a crowdfunding site that raised a total of 2,500 euros which cut the out-of-pocket cost of the trip from 1,500 euros to 500 euros per student. With this funding, more families were able to afford the program and sign students up. The students from College I’Eganaude spent two weeks in Tacoma where they experienced the Tacoma Art Museum, Washington State History Museum, the Hilltop Artists program at Jason Lee Middle School, and Stadium High School. They also visited Seattle. Most importantly, the students spent a lot of time with their pen pals at Mason Middle School in Tacoma. The growing relationship between Tacoma and Biot shows that even though there may be few commonalities between cities, there are always opportunities to develop new ones based upon person-to-person interaction. The Sister Cities International program pushes for cities to develop a strong relationship with their international counterparts where they can learn more about each other and consequently find new ways to further their connection. No Replies to "Tacoma, WA Celebrates 1st Student Exchange with Biot, France"